In both cases, most of the surrounding lands aren’t as magical as the one in the series title, but those nations don’t appear to be the most powerful or notable from the views of their respective worlds. Oz actually grows in its international reputation over time, but remains mostly isolated. The major world power in the Narnian world is Calormen, briefly mentioned in Prince Caspian but not really explored until Horse, which has an inimical relationship with Narnia itself. There are a lot of issues with the international politics in the Narnian world (which never gets a name from what I can recall; it’s tempting to call it “Aslan’s World,” but that better applies to the Lion’s heavenly realm). 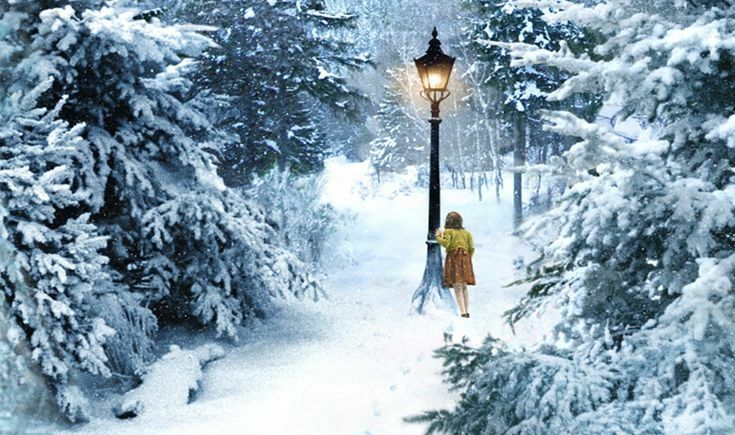 When first visited in The Lion, the Witch, and the Wardrobe, Narnia appears to be fairly isolated. I suppose there wouldn’t be much reason for other countries to have congress with a frozen land ruled by a wicked witch, and the Calormenes say as much in Horse. On the other hand, wouldn’t getting any resources at all in Narnia require trade with non-wintery parts of the world? Narnia in this book is also pretty much unfamiliar with humans, but later books establish that the human kingdom of Archenland lies directly to the south. If Narnia needed some humans to fulfill the prophecy about defeating the White Witch, couldn’t Archenland have loaned them some? Or were the Archenlanders not human enough, seeing as how The Magician’s Nephew eventually establishes them as the descendants of an English couple along with native nymphs, wood-gods, and river-gods? The issue of humans in Narnia is always a tricky one. And what were relations like between Calormen and Archenland and the Telmarine conquerors of Narnia prior to Caspian X’s reign? I’d be willing to accept Archenland no longer existed as a political entity at this point, but it’s mentioned in The Last Battle. Regardless, we end up with only four main countries on the Narnian continent, and Narnia and Archenland both seem to be pretty small. There are inhabited islands in the sea to the east of Narnia, but they mostly stick to their own affairs. It’s possible that parts of this world were never explored, but I guess it doesn’t matter that much when its lion-god decided to destroy the whole thing and replace it with an abstract Platonic ideal. The mini-continent on which Oz is located seems to have basically been created by taking the map of Oz itself and then surrounding it with other countries, many of which had been introduced in other Baum stories. This gives the place a bit of an awkward look, as making Oz both the center of the landmass AND an isolated nation surrounded by desert, it looks like travel between the non-Ozian lands would be rather awkward. How much communication would there be between, say, Boboland and Noland? We never see how far its world extends, but there are suggestions that Baum thought of it as being somewhere on our Earth. Regardless, we know there’s at least one fairyland on the other side of the world, and Ruth Plumly Thompson adds another continent to the southwest. It’s pretty clear that none of this was planned out when Baum started writing about Oz. He basically discovered it as he went, and later authors followed suit. Starting with one imaginary place and then expanding outward from there into other ones appears to be a common approach. 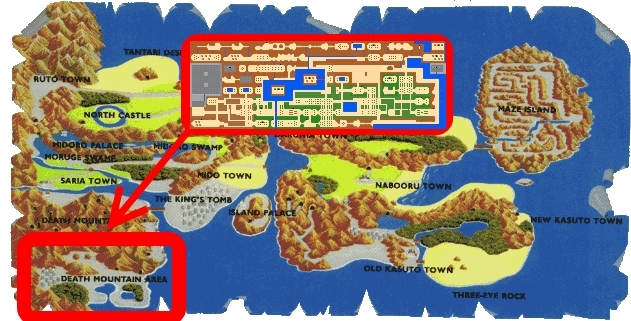 I’ve noted in the past how the second Zelda and Dragon Quest games both make the setting of the first game just a part of a much larger world. They also severely limit the places you can revisit, but space was at a premium in those early games. For that matter, I guess Super Mario Bros. 3 expanded its setting from the Mushroom Kingdom to the Mushroom World. 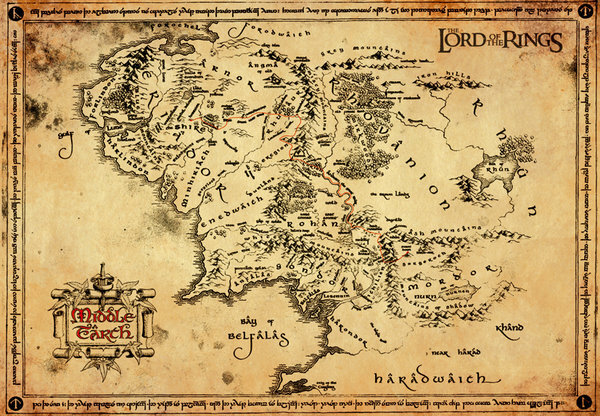 Getting back to Tolkien, the Lord of the Rings map is an expanded version of the one from The Hobbit. I’ve also seen it observed that the Star Wars Galaxy feels larger in the prequels than in the original trilogy. Other creators start by giving a basic overlay of a fictional world, then filling in the details. That’s basically what Terry Pratchett did with Discworld, where the shape, size, and functionality of the entire planet is described in the first book, but we have to wait until later to see most of its individual nations. 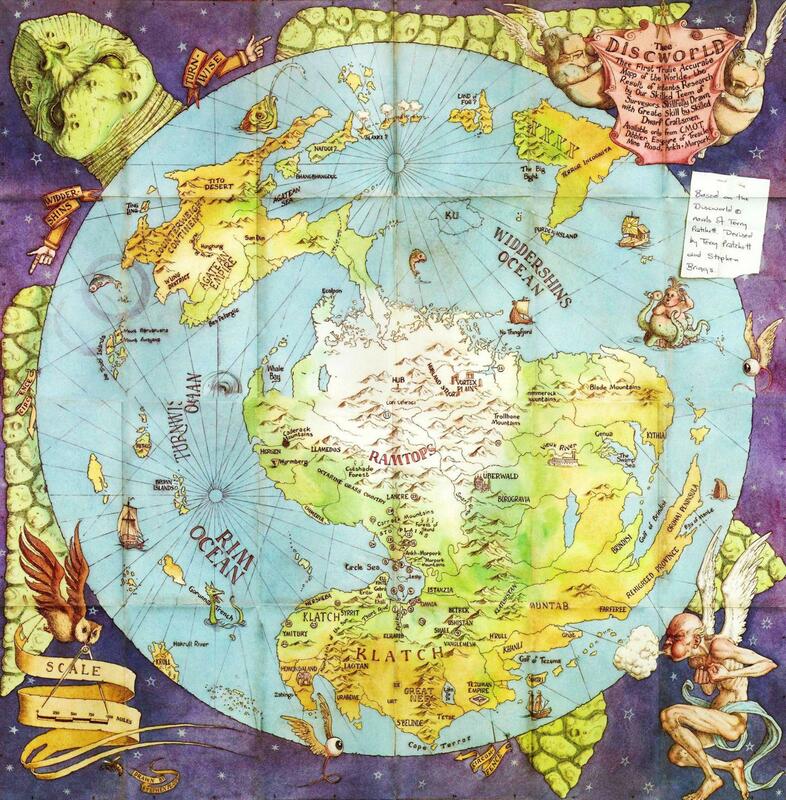 I know Pratchett wouldn’t let anyone draw a map of the place until several books had been written, and he scoffed at the idea of coming up with a map before you start writing. Much of the Disc is loosely based on real-world places, but there’s obviously a lot of leeway involved. Asia, for instance, is sort of split into two, with the equivalents of western Asian countries being on the same landmass as Ankh-Morpork, while the Counterweight Continent is basically a cross between China and Japan. There’s no area directly corresponding to the Americas at all, although some American cultures are represented in other places, like the Tezuman Empire paralleling the Aztec and Genua being largely based on New Orleans. Come to think of it, the world of Middle-Earth didn’t have an America either. Where’s the representation, British fantasy authors? This entry was posted in Authors, C.S. Lewis, Chronicles of Narnia, Discworld, Dragon Quest, Fairy Tales, J.R.R. Tolkien, L. Frank Baum, Maps, Mario, Oz, Oz Authors, Places, Politics, Ruth Plumly Thompson, Star Wars, Terry Pratchett, Video Games, Zelda and tagged alefgard, archenland, aslan, calormen, dragon quest ii, hyrule, lord of the rings, middle-earth, mushroom kingdom, mushroom world, super mario bros. 3, telmar, the hobbit, the horse and his boy, the last battle, the legend of zelda, the lion the witch and the wardrobe, the magician's nephew, the silver chair, the voyage of the dawn treader, zelda ii the adventure of link. Bookmark the permalink. 1 Response to Is Your World-Building Up to Code?